The Dell Color Laser Printer 5110cn offers powerful black and white and color printing performance for your networked environment. With print speeds of up to 40 ppm in black and up to 35 ppm in color (actual print speed will vary with use), the 5110cn includes networking and double-sided print capability as standard. Dell can also help lower your total cost of printing. The 5110cn ships with Dell's Color Track, a tool that allows IT administrators to designate color access, set print volume limitations and track usage on an individual or workgroup basis. Dell's Toner Management System - actively alerts you when toner levels are running low or due for replacement. Powered by 400MHZ processor, the DELL 5110CN is a powerful, professional laser printer for small workgroups. This DELL Workgroup printer prints clear and crisp document with max resolution 600 x 600 dpi. This DELL Laser Printer boasts a high print speed of up 40ppm in black and 35 ppm in color. 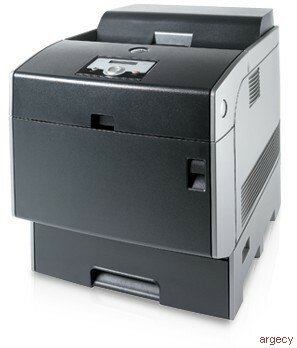 With a capacity of printing 95,000 pages per month, The DELL 5110CN is ideal for heavy business environment. With a standard RAM memory of 128 MB, this DELL Workgroup printer operates at a good speed enhancing your productivity. This DELL Laser Printer supports various media type like Plain paper, Cover, Coated paper, Transparency, Label stock and Envelope.